Well if you thought the Torsade bowl was fantastic, take a look at this one! It was made by Michael Hunter for Twists Glass in 2016. The cobalt blue conical coot supports a concave bowl. 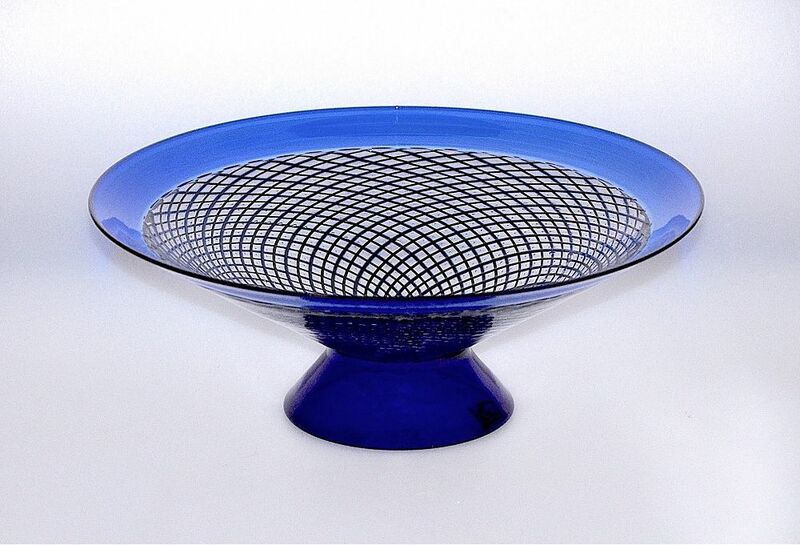 The bowl has two incalmo layers, the top layer being in blue glass, whilst the bottom incalmo layer which comprises 90% of the bowl is made of swirling criss-crossing canes in blue and black laid into clear glass with small clear bubbles in the diamond shaped clear glass intersections. The underside of the foot is scratch signed "M Hunter Twists 16". This is only the second reticello piece that Mike has made - the first one was a vase that found a home with one of our collectors several years ago. We love this bowl so much that we decided to use it on our home page.